Alpinultras 2017 was presented yesterday at Barcelona´s Museum of Sport, with the Catalonian goverment acting once again as host of the event. It is the second edition of this project dedicated to promoting the great ultraendurance traverses over high mountains, by means of seal of endorsement, race series and permanent centers. The seal covers five massifs through Europe: From the Teide Massif in the Canaries, to the Highlands of Scotland, the Pyrenees of Catalonia and Aragon, plus the Picos de Europa. Race series will be held at four of the seven mountain villages endorsed, as shown in calendar below. The first two mountains centers will be launched at Canfranc & Esterri d´Aneu. ALPINULTRAS 2017: SEAL, RACE SERIES AND PERMANENT MOUNTAIN CENTERS. 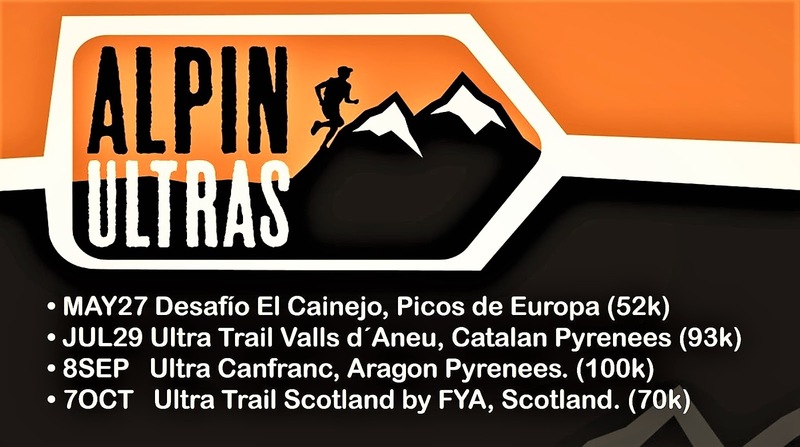 The three main areas of the project are moving on fast, with the Alpinultras seal of endorsement as the common denominator now present at seven different traverses into five different alpine ranges, now including the scottish Highlands for the first time, in addition to the previous Picos de Europa, Catalan Pyrenees, Teide Massif and Aragon Pyrenees. Scotland was selected among other options assessed in France, Andorra and Italy due to its unique mountain ife and sports heritage and its long standing tradition for running into the mountains on true alpine style. Only nine alpine runners surpassed the three great traverses that formed the Alpinultras series in 2016, completing over 323km of mountain steep trails at Emmona Ultra Trail (130k), UT Valls d´Aneu (93k) and Ultra Canfranc (100k). Among them, Sara Codina and Ion Azpiroz were present at Barcelona to share their experiences as series champions, and also confirmed their intention to defend its throne in the exciting season 2017, with a special tingling to go run long over the mountains of Scotland. The Ultra Trail Scotland by FYA will be a particulary challenging course over 70km. As reflected by Ion and Sara, all alpinrunners and race organizers are very much excited to move into Scotland, as a land well know for its rugged and gorgeous landscape as much as for its long standing heritage in the world of mountain sports. In fact, FYA race director Casey Morgan was already a direct witness as a runner himself at some of the Alpinultras in 2016. More details on this upcoming new event will be disclosed in the neaby future. The Alpinultras permanent centers are the second great novelty for 2017, along with the international expansion. From spring on, special services will be operational in Esterri d’Aneu and Canfranc, which will work throughout the year. Creation and marking of trails network for walking and running; Local information center to the rider and mountaineer; Non-competitive events during the year and guided trips with the area’s local runners are some of the services that will be offered to promote year-round mountain regions that host Alpinultras. The event ended with the joining of forces, all parts committed into working together so that the crossings of high mountain and the towns that welcome them come to be a bit better known with each and every day throughout the year. Pingback: #ALPINULTRAS 2017 EN MEDIOS. – Alpinultras: Travesías de ultrafondo en la alta montaña.